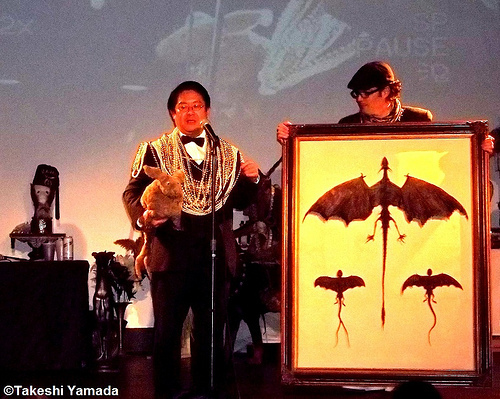 The last time Takeshi Yamada competed in the Secret Science Club’s Carnivorous Nights Taxidermy Contest was in 2011, when he won the “Shock and Awe Award” for his Jersey Devils. He also brought along a freak snake human baby and his constant companion the Sea Rabbit Seara. The Coney Island artist and rogue taxidermist will unveil his newest wonders and curiosities when the event returns to Brooklyn’s Bell House on Sunday evening. The contest was not held in 2012 and 2013 due to Superstorm Sandy, Yamada says. 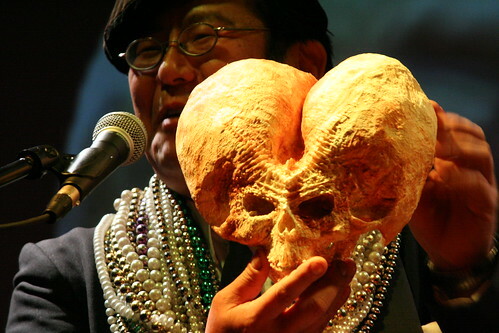 At the 2009 contest, Yamada was awarded “The Most Twisted Prize” for his family of freak show babies made from his own skin. There’s a Two-headed Baby, Mermaid Baby, Octopus Baby, Lobster Baby, Snake Baby, Penguin Baby, and Three-headed Baby. 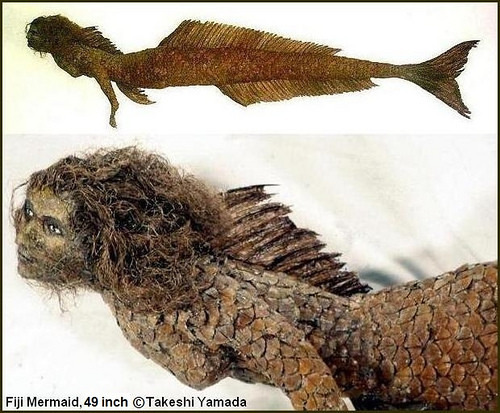 Yamada also won the Grand Championship of Taxidermy in 2006 for his 6-foot-long mummified Fiji Mermaid. She’s the one he tried to bring for a ride on the Cyclone roller coaster during the Mr. Cyclone Contest! Yamada, who has an MFA in fine art from the University of Michigan School of Art, considers his artwork “specimens” rather than examples of self expression. His new website shows examples of his rogue taxidermy artwork for sideshows and amusement parks, as well as TV shows and museum collections. There are also links to fan videos like this one from 2009 in which Yamada is the outside talker for his Freak Baby Museum in Coney Island. Special today, $1.00! This clip for AMC’s new reality show “Immortalized” introduces Coney Island artist Takeshi Yamada and his world of rogue taxidermy. It’s exciting to see our friend and his sea rabbit Seara, who are among the Boardwalk’s most recognizable eccentrics, on the cusp of TV stardom. In the unscripted series, Yamada is one of four “Immortalizers” who will face off against challengers in a taxidermy competition. 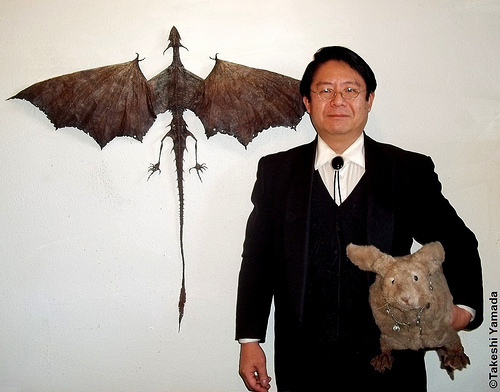 “I had a great time creating truly monumental scale and spectacular rogue taxidermy monsters for this TV series,” Yamada told ATZ in an interview (“Coney Island Taxidermist Takeshi Yamada in AMC Reality Show,” Nov 29, 2012). “Immortalized” consists of eight, half-hour episodes and premieres on Thursday, February 14 at 10pm. ATZ has learned that Coney Island artist and rogue taxidermist Takeshi Yamada will be one of the stars of the new AMC TV reality series “Immortalized” premiering on February 14th. “My sea rabbit will be a household name,” said Yamada, who is one of Coney Island’s most recognizable eccentrics. He is frequently photographed clad in a black tuxedo strolling the Beach and Boardwalk with his sea bunny Seara, a taxidermied wonder with webbed feet and a mermaid’s tail. When we first met Takeshi back in 2004, he was creating these gaffed specimens for traveling sideshows and museums. 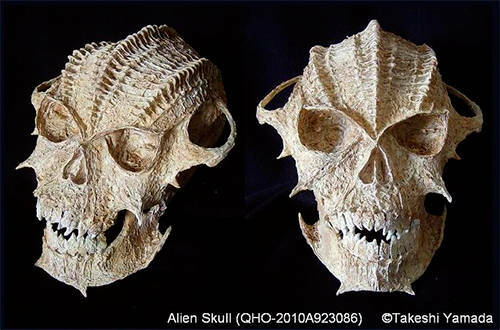 He uses a variety of natural materials to create his taxidermy art, which includes Fiji mermaids, two-headed babies, dog-headed spiders, and a mummified six-fingered hand. Having seen Yamada defend his Grand Master title at the Secret Science Club’s annual Carnivorous Nights Taxidermy Contest at Bell House, we can honestly say his challengers are up against a formidable competitor. The AMC series “Immortalized” consists of eight, half-hour episodes and premieres on Thursday, February 14 at 10pm. ATZ asked Coney Island artist and rogue taxidermist Takeshi Yamada what he’s bringing to Friday night’s Carnivorous Nights Taxidermy Contest at Bell House. He replied by sending his photo with the “Jersey Devil.” Can you believe it? For three centuries, New Jerseyans have been hunting the Pine Barrens in search of what Weird N.J. calls the state’s “oldest, most enduring, and important pieces of folklore” and it turns up in Coney Island’s Museum of World Wonders! Yamada is also planning to bring one of his freak human babies. At the 2009 contest, he was awarded “The Most Twisted Prize” for his family of freak show babies made from his own skin. There’s a Two-headed Baby, Mermaid Baby, Octopus Baby, Lobster Baby, Snake Baby, Penguin Baby, and Three-headed Baby. Which one would you like to see? Yamada also won the Grand Championship of Taxidermy in 2006 for his 6-foot-long mummified Fiji Mermaid. The Secret Science Club presents the 6th-annual Carnivorous Nights Taxidermy Contest, Friday, December 9 at Bell House, 149 7th St. (between 2nd and 3rd Aves) in Gowanus, Brooklyn. “Doors open at 7:30 pm. Please bring ID: 21+. $7 cover.” Subway: F to 4th Ave; R to 9th St; F or G to Smith/9th.